I’ve been inside the Burj al Arab before but have never been overly impressed. The central focal point of the lobby is an uninspiring fountain, flanked by two small aquariums which pale in comparison to the behemoths at the (albeit newer) Atlantis and Dubai Mall. An escalator goes up to the main floor where you have a full view of the world’s tallest atrium, ascending into a palette of blues, greens and yellows. Sounds impressive, but I’ve always felt it to be something of an anticlimax. Nonetheless, it’s still been on my bucket list of places to stay. So when Jumeirah launched their UAE Resident Rates this year, I took advantage of the opportunity to experience the world’s most luxurious hotel for myself – at the bargain price of AED 3300++ (just shy of US$900). 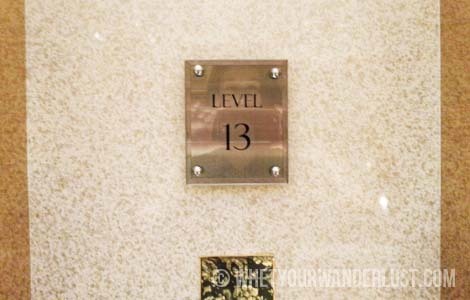 We were on lucky level 13. Each floor has a desk with butlers who are ready to tend to your every whim. The staff-to-guest ratio is 8-to-1, so there are plenty of people to ensure that you are well looked-after. 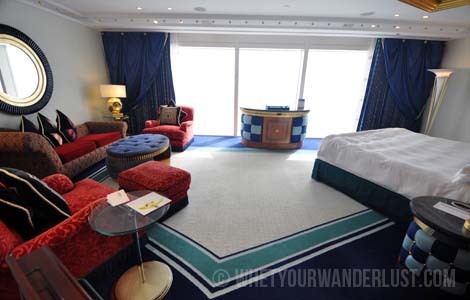 Every room in the Burj al Arab is a suite. And each of their “basic” suites is 170 square metres and set over two floors, with one bedroom, two bathrooms and views over the Arabian Gulf. Inside is garish and opulent, in cream, gold, yellow and blue. The mix of patterns and fabrics somehow works – stripes and paisley alongside a bright blue velvet settee and a floor-to-ceiling shiny gold TV stand. The coved ceiling is decorated with large gold rivets, and there’s a nautical feel which I suppose is only fitting considering the hotel looks like a sail. 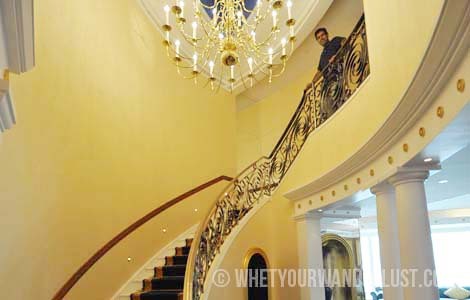 At the main entrance is a spiral staircase and a chandelier. Natch. Once you ascend the staircase you’ll find the bathroom to one side and the bedroom to the other. 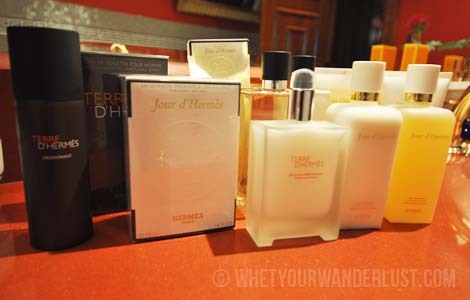 The Burj does brag about their “his and hers full-sized Hermès amenities” but I wasn’t expecting anything like this! 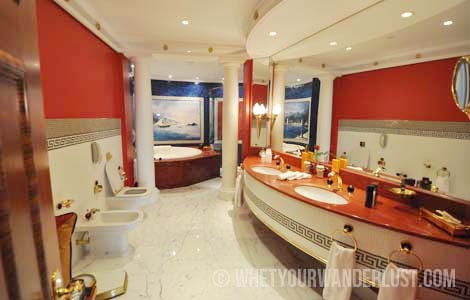 The bathroom is massive, with his and hers sinks, a jacuzzi tub, and a shower with 5 nozzles that would comfortably fit about 6 people – don’t get any ideas! The bedroom is also huge – the size of a normal hotel room – with a separate sitting area and more sweeping views. 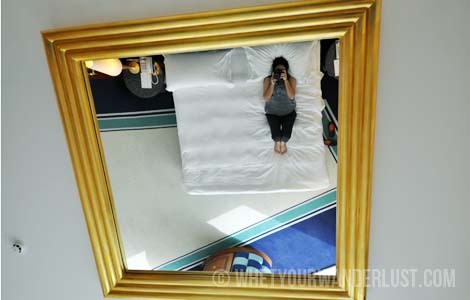 There’s even a mirror on the ceiling. Hello, me! There are 9 bars and restaurants in the Burj al Arab, some of which are only open to in-house guests and many of which only serve buffets. (When you’re already being so extravagant, why stop at gluttony?) We had lunch at Bab al Yam, which is a casual restaurant next to a tiny outdoor pool, neither of which quite feel 7-star. Others must agree as both are being refurbished this year. 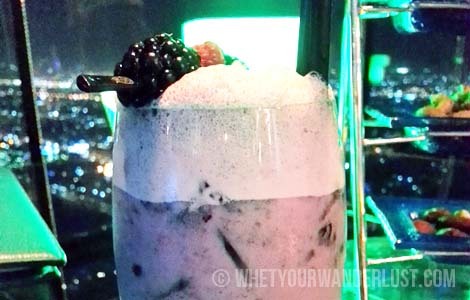 Before dinner, we had drinks at the Skyview Bar. Like the rest of the Burj, it’s decked out in exuberant decor, with an entrance like a motherboard and mood lights in green and blue. The hefty book of cocktails is inspired by festivals from around the world. I ordered the signature mocktail, the Eastern Delight – sparkling date juice, rosewater, plus some other less exotic ingredients. 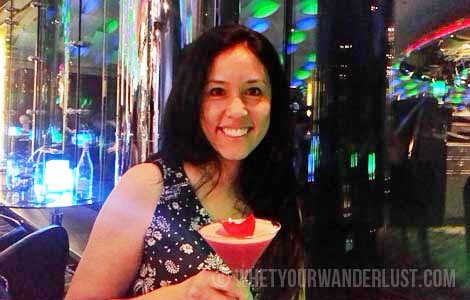 A bit steep at AED 85 (US$23) for a glorified fruit juice in a martini glass, but utterly delicious and well worth it for the gorgeous view overlooking Jumeirah. 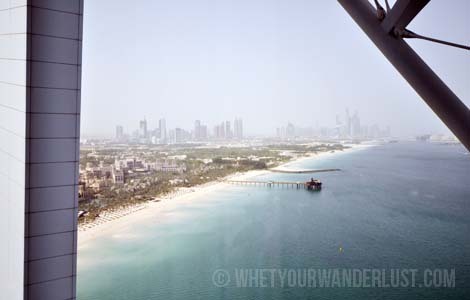 Plus you get to enjoy free canapés – mini quiches, big fat olives, flavoured nuts and the like – on a Burj al Arab-shaped tray. 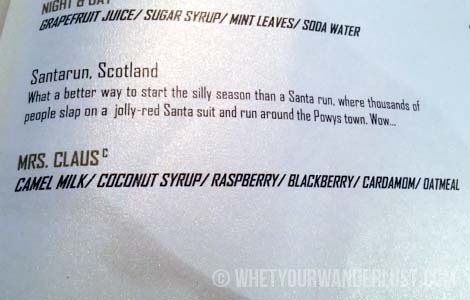 I returned the second night, and my affinity for weird concoctions backfired on me. My creamy mocktail was not quite as good. We ate dinner at Junsui, the Asian buffet on the second floor. There’s not much ambiance, but I love the all-you-can-eat teppanyaki. 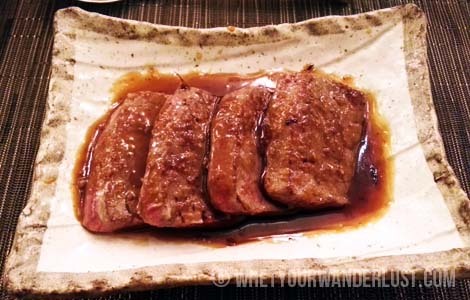 Apparently they serve wagyu (though it seems they keep the good stuff hidden in the back). I went back for three servings. 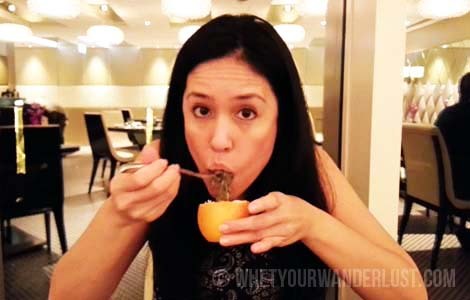 At the end of the meal, one of the many chefs brought a sweet granadilla to our table. It would be rude not to eat it! 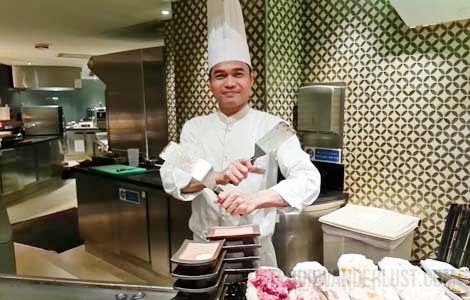 We returned to Junsui again for breakfast which was serving a very similar Asian buffet to the night before, with the addition of some Western breakfast options. I love eating dinner for breakfast so imagine how happy I was when the chef remembered me from the night before and offered to cook me a steak! Now that’s 7-star service! 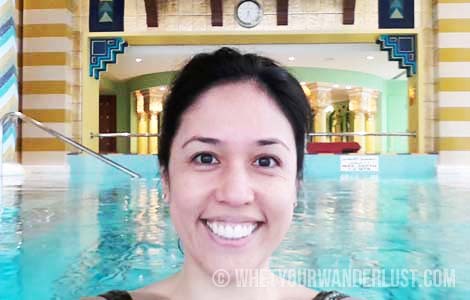 For me, the highlight of the Burj al Arab is the indoor pool at the Talise Spa. Heaven. 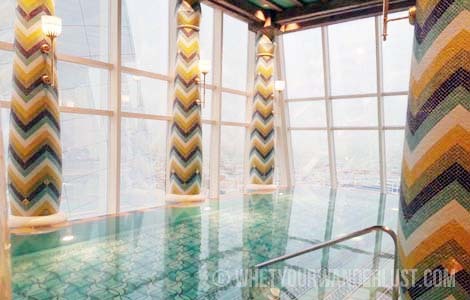 There are two separate yet identical indoor pools on the 18th floor – one which is mixed and one for ladies only. In keeping with the OTT design throughout the rest of the hotel, this room is also decorated in a flamboyant mishmash of patterns and colours – from mosaicked pillars with a chevron design to yellow and white striped pillars to carpet wall hangings with triangles to an out-of-place wood centerpiece above the large Rolex wall clock at the far end of the pool. This is some far-out decor. But it’s oddly mesmerising, especially if you’re lucky enough to have the pool to yourself. There were a number of other notable moments, from appreciating the amazing acoustics carrying the music from the lobby up to the 13th floor, to the assistance from the quality staff including Daniela from Guest Services and Sergio from the Skyview Bar, to the ride in their 2015 Mercedes S-Class to my car parked down the road. It was definitely a once-in-a-lifetime experience which I may just need to experience a few more times. Previous I’ve been nominated for the Liebster Award! mmm that drink looks delicious! 🙂 Beautiful hotel!